TODAY—UNDER A CANOPY OF centuries-old oaks, by lazy creeks and sweeping marshlands—a new community is taking shape. Picture lazy tidal creeks nestled beside sweeping wetlands and beautiful marshes that lead to the historic Ashley River. Enjoy the beauty of the land by day, and relax at night listening to the sounds of Nature— this is the feeling: the peace that living in the Lowcountry brings. This is also the epitome of Carolina Bay, a place of harmony and serenity—a simpler way of life in the Lowcountry—an area recognized as one of the most picturesque in the world. Carolina Bay-s 1,000 acres are shaded by ancient oaks and pines, dotted with magnolia and bay trees, and bordered by marshlands. Here you-ll find a variety of distinctive neighborhoods and home styles that blend into a rich tapestry with nature, linked by tranquil parks and common green spaces and unified by a sense of community. All of this is backed by Centex Homes- reputation as one of the nation-s preeminent home builders. A new urban town center planned for the heart of Carolina Bay will be anchored by live/work town houses, office space and retail shops. The town center will serve as a common area where diverse inhabitants of Carolina Bay can converge and connect. Carolina Bay will be a unique community within greater Charleston—a place where residents can walk to work, shop and enjoy the natural beauty of the area, as well as the many amenities offered. 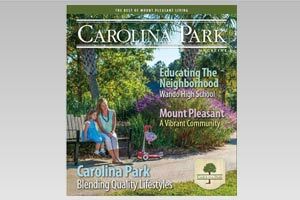 The master plan for Carolina Bay will include a nature trail that is carefully woven into the fabric of the land, winding past shady live oaks and palmettos and along bluffs and marshes that bind the community together. Plans also call for an on-site elementary school, so children can attend school in the safety of their own community, with friends from their own neighborhood. Elegant town homes, quaint cottages and homes for a growing family are linked through an innovative network of quiet roads, paths and trails. Centex also partnered with renowned architect Eric Moser to offer a collection of his Lowcountry-inspired plans. Three communities are now open: Cypress, Tidewater and Salt Grass. Cypress at Carolina Bay offers a wide selection of prestigious homes replete with top-of-the-line features such as vaulted ceilings, gourmet kitchens and sumptuous bedroom suites. Choose from six house plans with up to 3,200 square feet of beautifully appointed interior space. Salt Grass at Carolina Bay was inspired by the classic architecture of downtown Charleston, with wraparound porches and traditional details on the exterior. The interior caters to the needs of today-s families, with open, airy living rooms, large, open kitchens, and luxurious bedroom suites. Tidewater offers town homes with the space and comfort of a single-family home but with the convenience of luxury town house living. Interior detailing adds custom elegance and style.